Something’s about to happen. Today a long awaited dream is about to come true. No, I’m not getting married (SO not ready for that…) I’m done having children, it’s something else, not bigger, not better, different. Today a dream comes true. After three years of hard work on a project (and years of work from people before that) the next steps are about to happen, and it’s amazing. There are hundreds of people that have made this possible, thousands of dollars, countless hours of hard work. Today 7 people will gather in a room and talk and I cannot sleep from excitement. So why is it than when I awoke at 5:15 this morning all could hear is a voice in my head say, “you quit everything you’ve ever started?” Really? The demons are starting early this morning and they know right where to hit me. I pretend to claim it proudly. I quit things that are not worth it. For years music was my life; I ate, slept, drank, breathed music, for all the wrong reasons. I have blogged about music over and over again. I love music, there is no doubt. But I performed it because I was good at it, not because I loved it. I was “successful” at it, it was my drug. I will always be thankful for music because it saved my life, in more ways than one. By the end of high school I was practicing 5 hours a day. I was playing pieces people twice my age and talent dreamed of, and I hated ever second of it. I remember nothing but people pushing perfection because I was “so talented.” I wanted to be bad at it. Yes, partially because i am sick and twisted, but I did it for all the wrong reasons. I needed someone to be proud of me, for something, anything, and this seemed to be the thing they were proud of. I love my sister, and I watched her struggle hour after hour in practice, I watched her be rejected audition after audition, I would have gladly given her my spot. Today she is an amazing music educator, I am ridiculously proud. I could never do what she does, never, I would not survive. When I gave up a career in music and went to seminary I was called a quitter. I was told I was throwing my life away, a lofty career. In what? I thought. In self hate? Because that’s where this was going, I was already there. Every time I see a dream succeed the demons return. 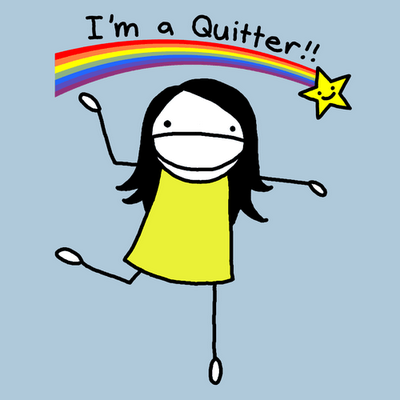 I’m a quitter. I’ll find a way to turn success into failure. Maybe this is why I’ve always loved the idea of community so much. If a group succeeds it’s the success of the group. If there’s a failure on the part of the group, I’ll take the blame in public (and usually blame everyone else in private but that’s a different confession for another time). The book of James says that all boasting is evil, and okay… whatever. But I will say this. I never want credit for success because I am terrified that every thing I touch will fail. How sick is that? It’s sick, but it’s true. Today a dream comes true, I will try, I promise, to bask in the glory. I will try, I promise, to that the people who made it possible, and I will, to the best of my ability, try to not consider myself a quitter. This was not an easy task, I had a TON of help. Thanks be to God. Amen. This entry was posted in Prayer, unconference unco.us and tagged music, quit, quitter, success. Bookmark the permalink.